The soldiers did it to amuse themselves, but the Gospels include this as a significant part of Jesus’ trial. I suspect that they include it because it has an ironic truth — Jesus is the king, and yet his rule would be preceded by rejection, ridicule and suffering. He has a crown of thorns because he is the ruler of a world filled with pain, and as the king of this corrupt world, he established his right to rule by experiencing pain himself. 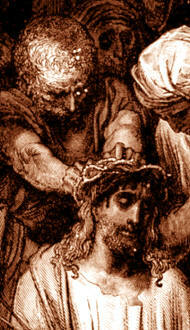 He was crowned (given authority) with thorns (only through great pain). The crown of thorns has meaning for our lives, too — it is not just part of a movie scene in which we are overwhelmed with the suffering that Jesus went through to be our Savior. Jesus said that if we want to follow him, we must take up our cross each day — and he could just as easily have said that we must experience a crown of thorns. We are joined to Jesus in the crucible of suffering. 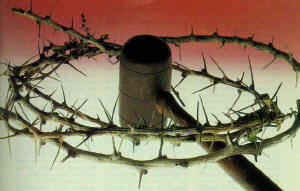 The crown of thorns has meaning for Jesus, and it has meaning for every individual who follows Jesus. As Genesis describes it, Adam and Eve rejected God and chose to experience for themselves evil as well as good. There is nothing wrong with knowing the difference between good and evil — but there is much wrong with experiencing evil, because that is a path of thorns, a path of suffering. When Jesus came proclaiming the arrival of the kingdom God, it is no surprise that humanity, still alienated from God, rejected him and expressed it with thorns and death. 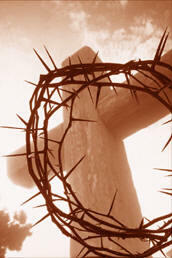 Jesus embraced that rejection — accepted the crown of thorns — as part of his bitter cup of enduring what humans endure, so that he could open the door for us to escape with him from this world of tears. In this world, governments jam thorns on the citizens. And in this world, Jesus suffered whatever they wanted to do with him so that he could redeem us all from this world of ungodliness and thorns. The world to come will be ruled by the human who has overcome the way of thorns — and those who give their allegiance to him will take their place in the government of his new creation. We all experience our crowns of thorns. We all have our crosses to bear. We all live in this fallen world and take part in its pain and sorrow. But the crown of thorns and the cross of death have met their match in Jesus, who bids: “Come to me, all you who are weary and burdened, and I will give you rest. Take my yoke upon you and learn from me, for I am gentle and humble in heart, and you will find rest for your souls. For my yoke is easy and my burden is light” (Matthew 11:28-30).